Available with either a fixed spindle (shown), i.e. 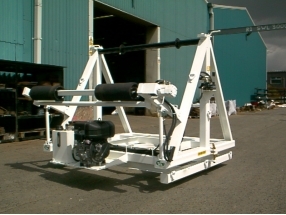 drum loaded by external means, or supplied self sufficient in lifting and lowering as used on standard Cable Drum Trailers in our range. Diesel, Petrol, Electric or PTO Drum Drive system for ease of cable payout. Bolt holes or twist locks for mounting to the floor of a vehicle. Turntable mounted which allows for 360 degrees of axis movement for total flexibility when solid mounted.